Hello. You don't know me and I don't know you. But today, you decided that you would walk up to the drive-through ATM at the bank, and use it on foot. Now, I understand that the bank location we were at does not have an ATM for pedestrians, and that you may not have wanted to go inside and talk to a teller. However, I saw you walk back to your car, get in, and drive away. What made you decide to use the ATM on foot instead of driving your car around and going through the drive-through lane? Do you have trouble getting close enough to the machine when you pull through, and figured it would be easier just to park and walk? Were you afraid you'd be wasting gas driving around the extra 50 feet from the parking lot to the entrance to the drive-through? Or were you trying to justify your walk from car to machine and back again as your "exercise" for the day? 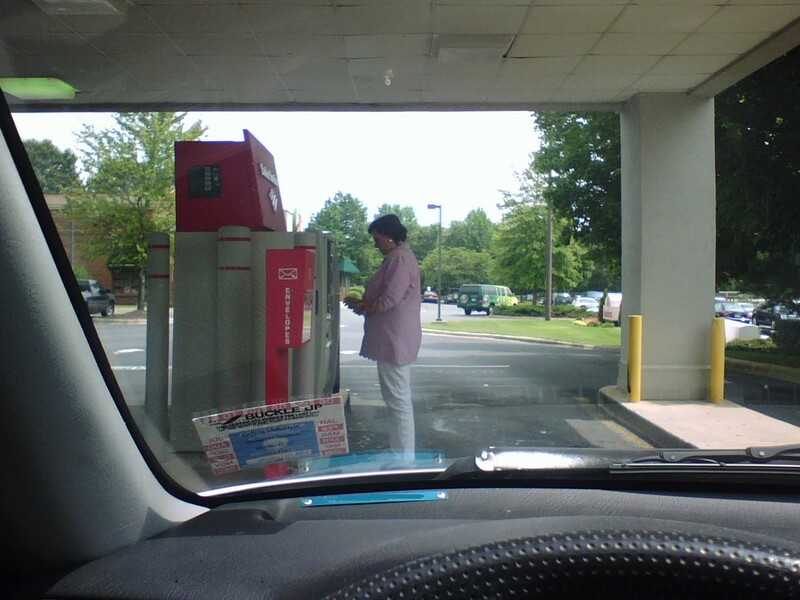 Any way you swing it, it's just plain odd to use the drive-through ATM on foot. And from the way that pickup truck driver was frowning at you as he nearly ran you over, it may be a safety hazard, too. Please use your car next time…if for no other reason than you'll find it less likely for your picture to end up on the internet when you are acting like a normal human being.